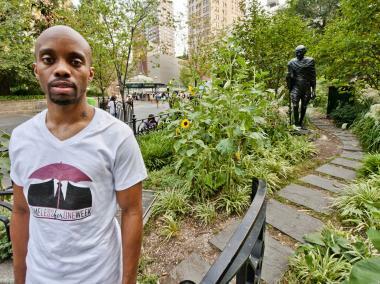 Yusef Ramelize, 35, in Union Square Park, where lived for a week in 2009 and 2010 as part of a homeless awareness project. GREENWICH VILLAGE — One week of every year since 2009, Yusef Ramelize has lived as if he was homeless, sleeping at night in Union Square Park and Grand Central Terminal instead of his own apartment. This was not a result of the recession, or job loss, but something the 35-year-old graphic designer did to increase awareness about homelessness and raise money for local outreach organizations. This year will mark the end of his “Homeless for One Week” project, and the week he plans to spend living in Washington Square Park, from Aug. 5 to 11, will be the last time he sleeps on the streets of New York City on purpose. He also plans to fast, and take a vow of silence. “The main reason why I started this is because I was looking for a creative way to raise awareness of homelessness,” said Ramelize, a creative manager at a publishing company, who lives in Ozone Park, Queens. Yusef Ramelize volunteering with Muslims Against Hunger. Homeless For One Week will raise funds for the nonprofit this year. After four years, though, “I know I want to take [advocacy] in a different direction," he added. For Ramelize, who is Muslim, going without food from sunrise to sunset is part of his fast for Ramadan — “a time when Muslims give back a lot,” he said. With this year's effort, he hopes to raise $5,000 for Muslims Against Hunger, a nonprofit that feeds the hungry in New York and New Jersey. Previous charities that have benefited from his week of living on the streets included Brooklyn nonprofit CAMBA, the Food Bank for New York City and the Coalition for the Homeless. Ramelize plans to continue updating his website and blog as he plans a new direction for his activism on behalf of the homeless. Like past places where Ramelize has slept, he chose the busy Washington Square Park, which is officially closed from midnight to 6 a.m., for its reputation as a haven for the homeless. After years of advocacy, Ramelize said he has a better understanding of the scope of homelessness. While mental illness and drug addiction are among the most common causes associated with homelessness, Ramelize has learned about students living out of their cars to afford tuition and single mothers forced to live on the street. “The extent of the type of person you would see going homeless over the past few years is much bigger than I thought,” he said, as people who were once middle-class have begun to struggle for survival. “Even I was naive about it going into the project," he said.